Hello everyone! Welcome to gorgeous Kunming, Yunnan Province, China: the business and industrial capital of the southernmost province of the most populated country in the world. I write this in my dormitory room – comparably equal in size to that of UPS but simply furnished – at Yunnan Nationalities University, or Yunnan Minzu Daxue. There are a number of universities within the city; Minzu Daxue (literally nationalities university) is a medium-sized university with departments specializing in studies of China’s ethnic minorities. Appropriate to the theme of our program, Minzu Daxue attracts students from nearly half of China’s ethnic minority groups (there are 56 nationalities total, including ethnic Han peoples who make up 91% of China’s population). Throughout the semester, I will be exploring various locations and cultures of these ethnic minorities whose histories reflect a truly unique side of Asia. Future entries will delve into the heart of Chinese culture, its fascinating people, and my personal observations and feelings of this study abroad experience. Today marks two weeks since I’ve been in China though it feels like I’ve been here significantly longer. The initial culture shockwaves of my arrival have begun to fade, and with it, the fear of regret and the unknown. (And the fear of being arrested for no reason which was, to my embarrassment, something I had worried extensively about.) Studying abroad is without a doubt one of the best decisions I’ve made thus far. It is something I highly recommend to everyone. I’ve included with this blog a picture of the fellow Americans I’ll be living, eating, breathing, and traveling with for the next few months. In this particular picture, we are at an older citizens’ community center in Tonghai, Yunnan (a town close to Kunming where we stayed briefly during our orientation week) where we watched a traditional Dongjing musical performance. A group of bound-feet women born as early as the Republican Era of China (1920s, post-Qing dynasty, post-dynastic system, pre-modernization) performed a number of routines they practice day-by-day to keep busy. They were the most adorable old women ever, all adorning impossibly miniscule shoes that only a toddler should be wearing. For those who are interested, the practice of bound feet was outlawed after the Communist Party liberated the nation in 1949. It had been practiced for over a millennia; established during the Tang dynasty as a way for women to appear and be more beautiful and delicate, bound-feet became the epitome of beauty. Nowadays, only extremely traditional communities observe the practice. It is generally looked down upon. 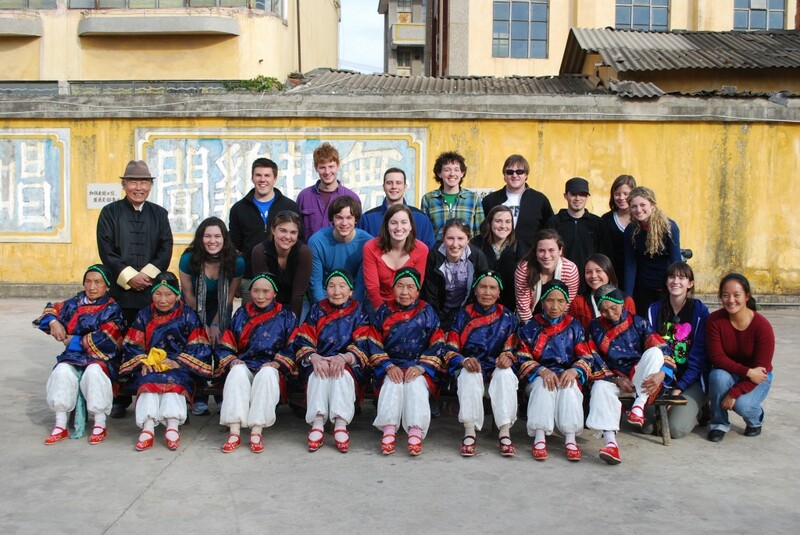 This entry was posted in Erin Hoshibata '11, China. Bookmark the permalink.